Japanese Boots, a photo by timtak on Flickr. The Japanese are good at making some things and not at others. According to my understanding, the Japanese are ego-involved in the image, the imaginable, res-extensa, space and place. Westerners are ego-involved in language. So generally speaking Westerners are good at making linguistic things, such as retail systems, financial services, institutions, laws, theories, drug formulas, and above all software, except heavily image-dependent game software. And generally speaking the Japanese and East Asians are good at making things - pretty much all things, especially those which capture and display images, but also cars, robots, lights, bicycle frames, motor bikes, trains, bridges, dams, architecture and computers other than the logical/linguist microprocessor "architectures". But there are exceptions, especially relating to cultural taboos. To the Japanese, nature is something rather special, sacred and to a degree taboo. Nature is beautiful and a little scary; not something that until recently, they felt able to go traipsing around in as a leisure activity, enjoying "outdoors". This is why many "outdoor" (they use the English word) goods, such as tents, rucksacks, raincoats, and climbing gear may be branded, if not made, outside of Japan. Another thing that the Japanese have not been very good at, and continue to import, is shoes. Britain imports very little to Japan but one product that can be purchased in any town are British shoes, made by Doctor Martens for instance. I presume that this may be due to the taboo associated with leather industry. Due to the Buddhism related prohibitions on the killing of animals (or at least land animals, with hair) the leather industry was traditionally considered impure and those that worked in it it likewise. This may have served to dampen the development of Japanese footwear. Who wants to wear wooden clogs (geta) anyone? But then again, the Japanese are excellent at making footwear for appearances such as those pictured above. They may not last all long, in terms of comfort, grip and walking speed, they may not compete, but they look...well anyway that the customer wants them to look, with heels, patters, toe extenders, and straps galore. 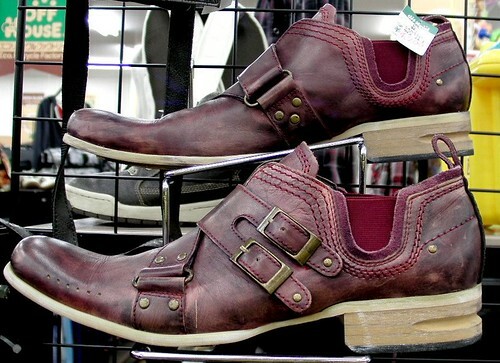 Japanese footwear brings my attention to another aspect of Japanese products: the sometimes place form over function. When it comes to what they do, other than look really cool, they are not always the best. Japanese cars for instance, may look good but they are often not 'drivers cars' because the qualities such as "responsiveness", or "handling" ar,e in so far as they can be communicated or represented, notional, ideational, arguably linguistic, and at least not something that Japanese designers can see or imagine and become ego-involved in. What about the car I drive, a Subaru Impreza WRX? It is the epitome of functionality over appearance. I can only surmise that there are exceptions to everything and point out that "Scoobies", as they are known and loved in the UK, are not very popular in Japan, and those that drive them are thought to be rather strange, "Subarists." Sadly, from my British point of view, Subaru seems to be in the process of being taken over by Toyota and seem to have given upon on their function above form philosophy.